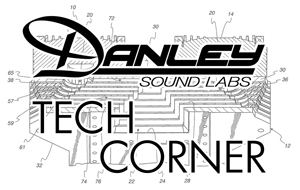 Tech Corner #2 Subwoofers | Danley Sound Labs, Inc. The audio world is full of people with very strongly held views! It seems that when the topic of subwoofers comes up, the opinions grow exponentially. So, since part of my job at Danley is to fact check against the laws of Physics, which as far as we know are not negotiable, I thought it would be a good idea to challenge some widely held beliefs about subs. This time is it is speed! Now, we all know that a dual 10-inch or a 4 X 10-inch cab is so much “punchier” then a single 18-inch cab, and we often attribute that to the fact that a 10-inch cone is less mass and can move faster than an 18-inch cone. That is true. It takes less energy to move a small amount of mass than a large mass. And it is true that a 10-inch speaker can move faster than an 18-inch speaker. But, it’s a question of application. A subwoofer, at least according to our definition, is a speaker designed to work below a certain crossover frequency, to extend the low end of a full range system. So lets look at the speed of an 18-inch driver. Let’s assume for this discussion that our crossover point is 80 Hz. The very fastest that the 18-inch driver can move is the velocity that it takes to move 80 cycles per second at its maximum output! If the driver can reproduce 80 Hz at its maximum output, it is by definition, moving fast enough! That is not a limit created by the mass of the driver, it is a limit imposed by the crossover! A 12-inch or 10-inch driver reproducing 80 Hz at the same displacement will be moving at the exact same speed! If the 10-inch driver is moving faster, it MUST be producing a higher frequency! That is either distortion (bad) or a messed up crossover (also bad). So here is the thing: in a PA rig, unlike in a bass player rig, the “punch” comes from the alignment of the subs to the full range boxes, and the system’s frequency response, not from any specific characteristic of the subwoofer.